On Mar. 21 & 22, the 7th game of the 55th Osho title match between Osho Habu and Kisei Sato was held in Sado Island in Niigata prefecture, Japan. Before the game, the score was 3-3. Habu won the first three games in a row and Sato won back the rest three games in a row, too. Since 4 wins in a row after 3 losses never happened in the history of shogi title matches, the result of the game gained broader attention. Sato went first(lower side, or Black) and Habu won the game with 98 moves. You can replay the full game here. The resignation diagram on the left is the position when Habu's promoted pawn approached to Sato's King from 5g to 6g. I try to explain why Sato resigned the game at the diagram. In case of P-9f, then N*8d would give hisshi(brinkmate) to Sente(black)'s King. Since there is no mate for Gote(white)'s King, Black is forced to resign the game. 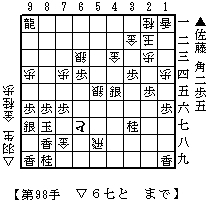 i just played you on the kurnik shogi site and lost to you . i know and have plyed larry kaufman and obcourse lost i also play IGO and have been to nippon and played at the shogi remmie with a two wins and a draw or lose i am not sure which this is a great site but i would like to be able to get a day to day update of shogi in nippon but only understand english. I believe Habu San will start to lose as he is getting older and in the world younger and younger people are getting stronger and stronger faster and faster. look at the IGO stage there is a amateur whom has beat 9P on a consistant basis. I guess this is as it should be. Nothing stayes the same and Habu San most also flow or get run over. >> Hello thomas allen giles, this is takodori, Thanks for your comment. In my observation, Habu did not lose big games against yonger players these days. In fact, he lost Kio and entitlement of challenging Meijin recently. But it was caused by Moriuchi in the same generation and Tanigawa who is older than Habu.